Tarsus was the birthplace of Paul the apostle(Acts 22:3). It is located at the northeastern corner of the Mediterranean Sea, about 9.5 mi. [15 km.] inland along the Cydnus River. In Paul's day the city was one of the top five intellectual centers of the Roman world — a center for the Stoics. Somewhere between 100,000 to 500,000 people lived there. The pass from the Cilician Plain into the heartland of Anatolia, the Cilician Gates, lie 27.5 mi. [44 km.] to the north of the city (via the ancient road system). To the east were the "Syrian Gates" which provided access through the Amanus mountains to Asia. 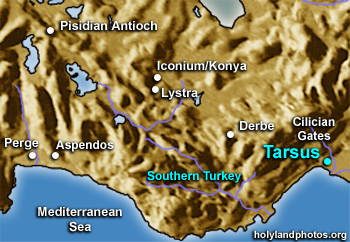 Thus Tarsus was an important center for east-west transit traffic. Paul was actually a citizen of this distinguished city (Acts 9:11; 21:39). Since he was sent to Jerusalem at an early age, to be trained there under the famous Rabbi Gamaliel, it probably wasn't until after his conversion that Paul interacted with the Greco-Roman culture of Tarsus — spending some 12–13 years there before embarking on his first missionary journey. Today about 190,000 people live in Tarsus. To view the massive, but mysterious, Roman Temple at Tarsus Click Here.